SMS consortium recognizes that an effective management and organizational structure is critical for the success of SMS. Our objective is to establish flexible and effective mechanisms, which ensure that the whole array of specialized skills and interests represented in the consortium are fairly represented following a flexible approach that supports dynamic reconfiguration. The PCB is the highest-level management body of SMS and consists of the Project Coordinator and representatives of all SMS contractors. PCB will only meet once a year to review and plan project work. The European Commission will be invited to participate in the PCB. changes in time plans, resolution of conflict between different WPs. This Groupwill meet once every three months, includes all WP Leaders, and will be SMS driving force. The Project Coordinator that is responsible for the scientific and technical directions and issues of the project and the Administrative Manager that will be responsible for the financial and administrative issues of SMS compose MT. requirements of a particular work package. The ACM within SMS will be chartered with helping to steer SMS key goals and indicating how the project can leverage networks and outcomes of pertinent initiatives. The Committee will comprise a number of high-profile experts in ICT Research Policy, selected on the basis of their expertise and objectivity with the aim of ensuring effective knowledge exchange through engagement with the Working Groups (1) Members representing Water Management; (2) Industrial representatives; (3) Balanced representative from geographical regions; Meetings of the ACM would take place once a year immediately following theappropriate SMS WG meetings and the SMS event so that AC members could attend the Working Group meetings and then meet to comment on the activities as well as suggest future directions. ACM Role and Tasks: (1) Analyse the activities and results of the SMS coordination action and help steer discussions with future challenges. (2) Help Shape direction and future activities together with the consortium, which would be reflected in the SMS reporting. (3) Contribute to the SMS Working groups & Events and to contribute with specific content, if appropriate. ACM will issue a report / minutes of their meetings with specific comments and recommendations to the consortium. Additionally the coordinator and Executive Board will participate to the ACM meetings. The composition of the Advisory Board must reflect the broad base of stakeholders that will be affected by the project. formal communication between the project and the Commission as well as any other external stakeholders. Additionally, the role of the PC is to audit the R&D performance of the project and ensure successful implementation of technical and business objectives. PC is responsible to resolve any issue arising from the detailed project work programme and to ensure that effective solutions to any implementation problems or technical limitations are devised. This part is undertaken by CERTH, a major Research group with significant related experience in coordinating big consortiums. The AC will be responsible for the administrative and financial issues of the project and will support the project partners to prepare financial and administrative reports. AC will not only produce and monitor the Annual Financial Statements, but will also receive the Partners’ person effort and expenditure on a Quarterly basis. AC will provide feedback to the Partners, PC and EB. This part is undertaken by U2. 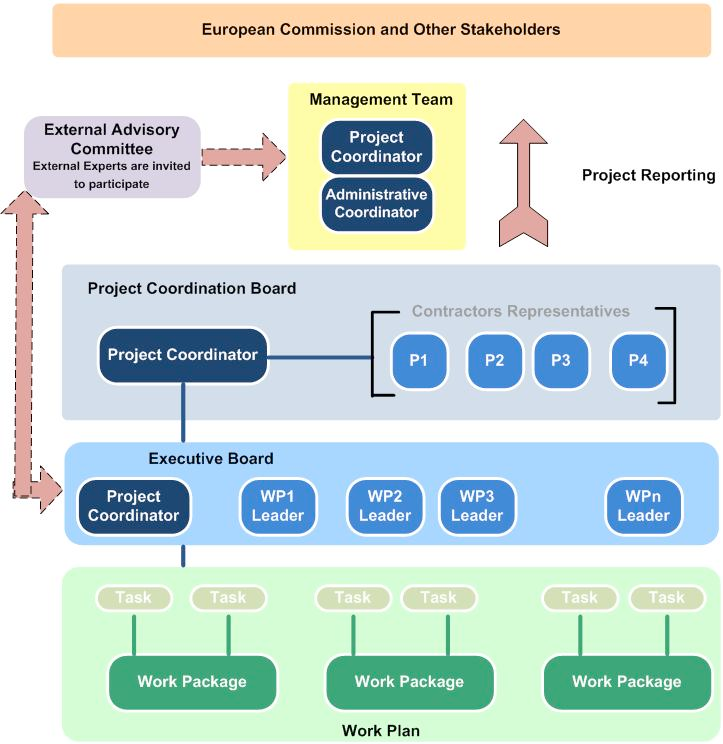 WP Leader refers both to a contractor and its executive and implies the responsibility to ensure the streamlined execution of a particular Work Package as well as the management of the associated working group. Each WP Leader is also responsible for resolving WP internal problems, reviewing WP deliverables and reporting to the PC.